Control up to 192 power outputs from one remote network port by connecting 16 EMU3s together. Power management, control and monitoring are two of the most important issues facing systems administrators. With multiple installations spread across different locations, the need for a simple, centralised control solution is vital. The need to manage every aspect of performance, from controlling individual outputs to monitoring alerts has never been greater. Built on the success of their predecessors, our third generation EMU3 Intelligent PDUs not only offer an ergonomic web interface portal, but also deliver seamless integration with our IDS ecosystem allowing both remote control and monitoring. This allows key critical information to be displayed on an IDS screen anywhere on the network. A vital function for engineers to proactively respond to faults and deliver true preventative maintenance. Intelligent environment sensors connected to EMU3 can be used to harvest primary information like temperature and humidity, all clearly displayed via an IDS screen. 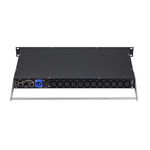 Up to 16 EMU3 units, either the single input EMU3 or the dual input auto-changeover EMU3aco can be linked together and controlled from a single network port. The EMU3 delivers a feature rich solution that is both scalable providing a low cost of ownership. Through our in-depth experience and knowledge of the market, EMU3 has been development as a world class solution to meet current market demands. Broadcast, museums, finance, education, marine are just some of the industries adopting EMU3 to keep mission critical systems alive. Intelligent, expandable distribution. Our PDUs have an embedded web server for complete control. Our intuitive web interface provides quick and easy access to control and configuration facilities. Monitor the health of racks, see the status of every output and receive email alerts if pre-set limits are exceeded. At-a-glance system status. Monitor every output on every connected EMU3. All EMU3s are continuously polled for status. Configure individual emus and outputs. On ACO units each input is monitored and the active input clearly displayed. Configure network interfaces including IP address, subnet mask, gateway and API port numbers. Set master parameters for the EMU3 such as name, start-up sequences, enabling email alerts and temperature ranges. Configure settings for each output such as name, load shedding, status and cycling. Shed load when UPS active, restore when GPI is removed. Control ACO inputs. Power up from the browser. Switch outputs on and off manually or set to cycle. 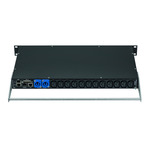 Extendable rack-mount solutions that provide continuous real-time information about your system. At the same time delivering a reliable power supply or instantaneous switching between primary and secondary power supplies. Designed for critical applications. In addition to the EMU3 Web portal, use an IDS system to remotely control or monitor your EMU3s. Information gathered from GPIs and environmental sensors connected to your EMU3 can be passed on to your IDS system for displaying as part of your IDS content management. 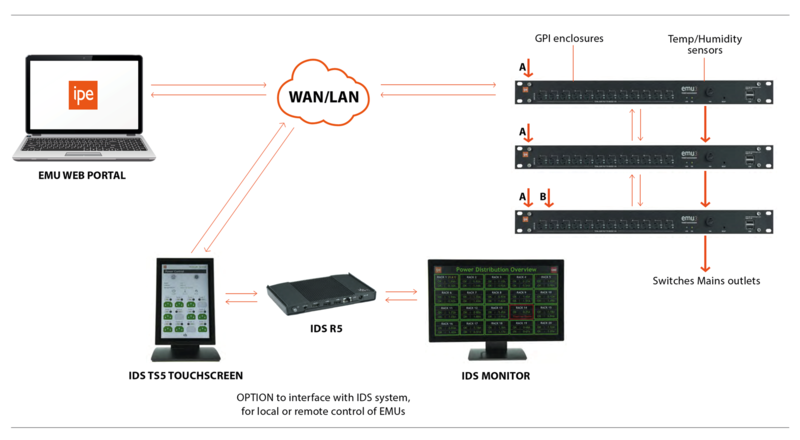 Likewise, use your IDS touchscreen within the IDS eco-system to control and monitor the individual ports on your remote EMU3s as part of wider control system. Together with for example, control of DMX lighting and motion parameters of your remote cameras. Building on the success of our EMU3 range, we went to market and listened to the feedback from our diverse range of global clients. Resisting the temptation to reinvent the wheel, we took the already stable foundation of the EMU3 and added industry leading features to the new EMU3 mark II range of power monitoring units. Our new intelligent EMU3 is now available with automatic change over (ACO). All units also come with an embedded web server that enables continuous remote control and monitoring. They can be daisy-chained to other EMU3 units to provide up to 192 outputs via a single IP connection. (maximum of 16 units in total).